The economical solution for moderately modified cars or simply aggressive individuals with stock power. Offers an estimated 40-50% increase in torque capacity and maintains stock pedal feel. 300 mile break-in recommended with this set-up. 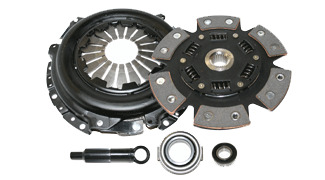 The 2400 Series kit includes a Competition Clutch pressure plate, a 6 pad Carbotic high-torque performance disc assembly, all applicable bearings and the appropriate alignment tool. (Some kits may not be supplied with all pieces. Please verify with Competition Clutch before ordering). Want this item shipped out today, April 23? Order within the next 12 hrs 36 mins.